U.S. Marines from the 2nd Battalion, 8th Marine Regiment, battle a virtual enemy through the Future Immersive Training Environment (FITE) at Camp Lejeune. A team from the U.S. Joint Forces Command created the joint capability technology demonstration to determine the most effective way to train young recruits. Close-combat warfighters become wrapped up in their training. A joint capability technology demonstration project currently underway is literally clothing U.S. soldiers and Marines in computers and placing them in virtual scenarios. The program is upping the investment in modeling and simulation developments—traditionally focused on land and air vehicles—to better reflect current operational needs. It aims not only at augmenting traditional training methods but also at determining the most effective ways to reach and teach the newest generation of warfighters. The first phase of the joint capability technology demonstration (JCTD) was unveiled at Camp Pendleton, California, last fall. The Future Immersive Training Environment (FITE) may not quite be ready for prime time, but the initial soldiers and Marines who have had the chance to examine the environment give it a rousing thumbs-up. Jay Reist is the U.S. Joint Forces Command’s (JFCOM’s) operational manager for FITE. The virtual reality-based system recently was demonstrated to Marines at Camp Lejeune, North Carolina, and soldiers at Fort Benning, Georgia. FITE was designed to address requirements identified by the services as well as combatant commands such as Special Operations Command. Military leadership has not made ground-based training a high priority in the past, Reist contends. But with the dawn of a new era of terrorist activity, it realized the need for overall close-combat simulation capabilities has become crucial. JFCOM’s work on FITE is the command’s way to support the U.S. Defense Department’s campaign to enhance these capabilities. Members of the II Marine Expeditionary Force participated in the unveiling of the East Coast demonstration at CampLejeune. To achieve an immersive training environment, they wore technology-filled body suits and head-mounted devices that are the wearers’ interface for interactive and interpersonal participation in the ground-combat scenarios. The body-worn equipment provides connectivity among the trainees and to synchronized visual, auditory, olfactory and even haptic events within the virtual setting. If shot, the warfighters feel a slight electrical charge so that they know they are injured or dead. The integrated hardware and software are controlled and powered by a box approximately the size of a brick. The troops move forward in the setting by pushing a toggle switch on their lifelike weapons. Through the integration of all this equipment, warfighters are immersed in a situation where they must act, react, cooperate and make critical decisions. They see, hear, smell and feel what is happening around them virtually—and they believe. While based on a commercial video game—Virtual Battlespace 2 created by Bohemia Interactive Australia—FITE includes significant changes, Reist notes. Synchronizing the sight, sound, smell and feel of the scenarios was both the toughest and most rewarding aspect of creating the training environment, Reist relates. The demonstration at CampLejeune comprised two units of 11 warfighters, one platoon sergeant and one platoon commander. Reist explains that each unit included Marines who had just entered the service as well as seasoned warfighters who had been in current operations at least once. At the beginning of the CampLejeune event, the warfighters spent the first half day training on the equipment. They then donned their technology-loaded uniforms, moved into a room approximately 30 feet x 50 feet and began fighting a virtual war in a scenario that JFCOM built using input from the other combatant commands. The scenarios are Afghan-based and counterinsurgency focused. Reist notes that on the first day in the demonstration’s virtual world, the warfighters did not know what to expect; however, by day three they were completely immersed in the capability and were asking when they could run the next scenario. Each scenario lasted from approximately 30 to 45 minutes, so the units had enough time to participate in four or five scenarios each day, including briefings at the beginning and end of the day. The focus is on situational awareness and creating anomalies that the troops must detect as they proceed. Although they follow a general script, the storylines are not locked in. The JCTD is one way to fulfill the need for enhanced training concepts and better training tactics, Reist emphasizes; and if done correctly, the training vignettes could become the standard. For example, in one scenario a squad is entering a village to speak with an elder. “We present them multiple decision points along the way [during the scenario], where, if a unit makes a decision that is different from the norm, we let it play out so that they can learn what will happen,” Reist explains. The results of their decisions reinforce good decision making and demonstrate that a bad decision increases the complexity of a situation, he adds. The primary objective of the FITE JCTD is to determine the best way to train the 18- to 24-year-old men and women entering the services, he explains. Members of this generation grew up mesmerized by video games, so using virtual reality to enhance training seems like a logical step. But it is only through testing this theory that military trainers and leaders can be sure. FITE is one approach to finding the answer to that question, Reist states. “The better we prepare them in terms of ground-based operations, the better they will perform when we put them in a complex environment where they have to make complicated decisions sometimes of an ethical and moral nature,” Reist maintains. FITE observers watch as participants make decisions during the immersive technology’s scenario about entering a village to speak with its mayor or other top official. In addition to participating in the scenario, the platoon leader led the after-action review session. Part of the technology enabled them to replay each scenario with both audio and visual integration. “It gives the platoon leader a ‘God’s eye view’ of what took place within the virtual world. Platoon leaders were able to replay all or pick out specific tags along the way that were of events that were critical for learning. We determine where the critical decisions are made, he replays those to review them,” Reist explains. The after-action review is an opportunity for the platoon leader to point out where he thinks warfighters need more training, he adds. During the last week of the demonstration, Reist admits a couple of eye-openers emerged. The first lesson was to not take for granted that the rate of acceleration of unit cohesion is known, he says. The FITE creators believed unit cohesion was important and could occur, but they did not think of the training tool as a way to bring it about. Instead, the JCTD showed quick cohesion within each unit and seamless collaboration between the new troops and the experienced warfighters. Recognizing that the new generation grew up with video games and all of the special effects involved was the second lesson learned. Consequently, military leaders must understand the bridging, capability and desire they must have to use these tools, he adds. Although FITE was not intended to explore these behaviors, they were welcomed additional lessons, he notes. And, although it is not one of the system’s objectives, Reist says some experts believe that exposure to these volatile environments prior to deployment could reduce the level of post-traumatic stress disorder in some way. The JCTD could not have taken place without the support of additional organizations, Reist notes. For example, the Office of Naval Research is the technical management lead for the project and the Program Executive Office Simulation, Training and Instrumentation represents the technology transition interests of the JCTD. Even the Joint Improvised Explosive Device Defeat Organization plays a part by adding its expertise and insight for realism as well as to help train troops about improved explosive devices. The FITE JCTD was evaluated by independent subject matter experts who specialize in human performance and will help the military determine the capabilities that will be most useful. In addition to ensuring that the method reinforces good decision-making and increases trainees’ attention to situational awareness, the subject matter experts examine how specific technologies support unit cohesion and communications skills. They also created an independent assessment plan and gathered information in these areas by interviewing the participants as well as analyzing the demographics of warfighters participating in the demonstration. Once complete, the assessors’ report will be submitted to JFCOM’s commanding officer, Gen. James N. Mattis, USMC, for review. Spiral one of the FITE JCTD began in fiscal year 2009 and will finish at the end of fiscal year 2010. At that point, the technology would be transitioned into the services that would pursue acquisition if they believe it to be beneficial. Spiral two of the demonstration will feature a completely different system. The FITE team will attempt to immerse technology-wearing warfighters into a mixed real-virtual environment, physically in a training area but seeing and experiencing more than the objects in the physical setting. “It would be like enhanced Hollywood sets with animatronics, avatars, artificial intelligence and stereo sound—all of those sensory inputs brought into a live training venue, which ramps up the realism,” Reist explains. Funding for spiral two already has been allocated, he adds. The most telling reaction to this training method was what occurred after the demonstration was over, Reist shares. Although the warfighters were free to leave, they asked the FITE team to allow them to stay and fight force on force until one person was left standing, and that is exactly what they did. When a single warfighter claimed victory, all of the trainees cheered, he relates. Recreating an entire battlespace scenario that includes realistic human behavior is not as easy as simply handing out 3-D glasses in a movie theater. But the laws of physics did not dissuade U.S. Joint Forces Command (JFCOM) engineers and scientists from replicating the way the human brain works to the degree current technology allows for use in systems such as the Future Immersive Training Environment (FITE). Instead, they are engaged in modeling human facial expressions, body movement and crowd behavior. The ability to read cues from these activities could be life saving when warfighters enter unfamiliar territory. Lt. Col. John Janiszewski, USA, simulation operations officer, J-7, JFCOM, explains that while artificial intelligence has made great strides, human behavior still cannot be replicated identically in virtual simulations. Instead, role players are “behind the curtain” to ensure human behavior is represented properly. But the goal of the colonel’s group is to minimize this step. The work involves developing virtual humans whose cultural features and behaviors duplicate those that warfighters are likely to see in the field. If they can arrive at the “good enough” point where trainees cannot tell whether a virtual being is a representation of a real human or an avatar operating on its own, they will have taken modeling and simulation to the newest dimension. Col. Janiszewski identifies three areas that require improvement in modeling human behavior before this can be achieved. The first issue is the actual physical representation of humans, because training systems are not yet able to express gestures, postures, movements, speech and body language flawlessly. Without this capability, warfighters cannot be trained to pick up on these cues, which could mean the difference between mission success and failure, the colonel says. The second area that needs to be enhanced is the intelligence of simulated humans. Virtual entities will need to behave comparably to live civilian role players when troops enter a village, for example. Achieving this will require significant advances in the basic science of modeling human behavior, including culturally specific human motivations, perceptions and actions, Col. Janiszewski states. 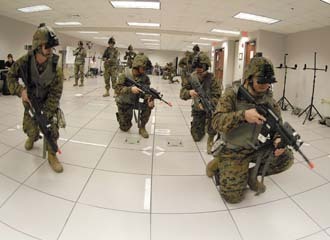 A realistic immersive training environment is the third aspect that is required to perfect learning within simulations. Warfighters must see, hear, smell and feel as if they are in the real world, the colonel says. The setting must include representations of the indigenous village population that troops can interact with, as well as give them the ability to communicate with the villagers and members of their own unit. Since 2005 when the work began, JFCOM personnel have experienced small victories in providing these needed improvements. The Joint Warfighting Center (JWFC) has partnered with the Virginia Modeling and SimulationAnalysisCenter at OldDominionUniversity, Norfolk, Virginia, to develop a model that replicates how a crowd mentality may affect individuals. Col. Janiszewski’s team also helped create FITE’s virtual environment. Building on a commercially produced military video game, the group tweaked the models and simulation to bring it in line with the real-world military environment. To make progress in the area of social science so that modeled behavior can reflect human behavior more closely, the JWFC has been working with the University of Pennsylvania, Philadelphia. The school has been using cognitive computer agents, social computer agents, economic models and story generation tools to represent human conduct. Successes from this work were then brought together to create a village called Nonkin, or NonkineticVillage. Training that would realistically represent the residents of towns and villages in a volatile region could be extremely helpful if troops are able to practice within them before entering a village, Col. Janiszewski says. VBS2 is developed in the Czech Republic, not in Austrailia.